Bousfields was retained by Urban Capital, Malibu Investments and ALIT Developments to support the redevelopment of an underutilized site located at the southeast corner of Peter Street and Richmond Street West within the City’s Entertainment District. 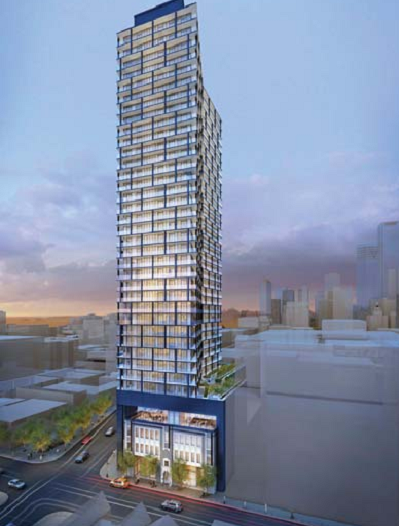 The proposal is for a 36-storey residential building with office and grade-related retail uses. The proposal retains the façade of the existing warehouse building and introduces a covered, publicly-accessible open space along the street frontage. Bousfields was part of a team that included architects Wallman Architects and Montreal-based landscape architects Cormier and Associates. Bousfields was responsible for preparing the Planning and Urban Design Rationale in support of a rezoning application for the proposal. The project is currently under construction.